The report highlights four key vulnerabilities to the Canadian financial system. Most notably the first two were directly tied to the housing market. Households are taking on more debt as house prices continue to rise. 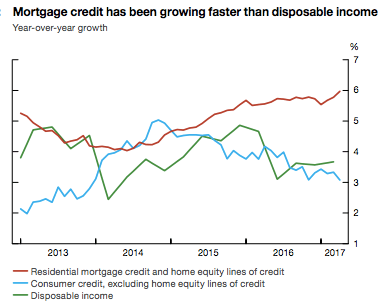 Mortgage credit has been rising faster than disposable income. Mortgage credit and Home Equity Lines of Credit are growing. Canadians are aggressively tapping into home equity lines of credit. Using their homes as an ATM, cash is being siphoned out in dramatic fashion. The number of HELOC’s have grown nearly 40% since 2011, with outstanding HELOC balances reaching $211 billion in 2016. House price growth reached 20 per cent nationally on a year-over-year basis in April. The majority of that growth coming from BC & Ontario where prices have surged by 32% in the Greater Toronto Area and continue to grow in BC, particularly in the more affordable suburbs such as the Fraser Valley. 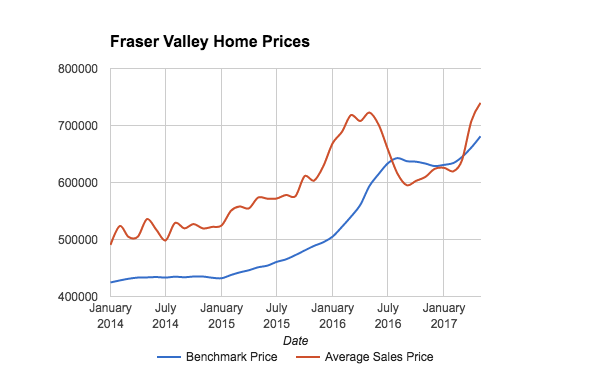 Fraser Valley Real Estate Prices are up 15% year over year. According to the Bank of Canada these vulnerabilities are in check for now but could be triggered by four possible scenarios. A severe nationwide recession leading to a rise in financial stress, a house price correction in overheated markets, a sharp increase in long-term interest rates driven by higher global risk premiums, and or stress emanating from China or other emerging-market economies. Full report here.